Sketch made by R. Canzanese. Idea is that pedals, and motor will all drive the same jackshaft, which will drive the rear wheel. If the rear wheel contains a freehub, and the pedals' cogs at the jackshaft contain freewheels, the wheels can spin independently of the motor. This design assumes NO regenerative braking. determine what the mass penalty is for an overall optimization function. a few good design books that could help frame the discussion. would make the ride easier. motor speed exceeds pedal speed, so it will start to turn the pedals. can't guarantee which gear you're pedaling in when you regen. it would be to disable the freewheel on a hub. gears. We wanted the vehicle to also be pilotable by a singe rider. I crunched some numbers for a vehicle driving river-to-river on Chestnut street and stopping at 1/4 of the traffic lights, but didn't come up with results that made sense, so I will rerun the numbers this afternoon to try to better quantify the effects of regenerative braking. I would like to see numbers that legitimize the additional cost, weight, and complexity of regenerative braking, as I continue to remain skeptical. The roller idea is novel. What about a 3-speed internal hub instead? against the wheel when you want regen, that could serve as your clutch. rid of excess kinetic energy, who cares. If motor-as-generator is used to charge a battery, a voltage regulator would be required. To hook up the generator directly to the battery without a regulator would be a potentially hazardous situation (battery overload leads to explosion/leak, fire, fumes, damage to motor or other electrical components, etc). The voltage regulator acts as a voltage-controlled current source to force a fixed voltage to appear across the regulator's output. The voltage controlled current source uses a feedback loop to monitor the output voltage and adjusts the voltage-controlled current source accordingly. Also, note that capacitors across the input (Vin to ground) can improve the voltage regulator response. See the following diagram. Modern voltage regulators are capable of operating with input voltages below, at and above the desired output voltage, depending on current needs. This means that the lower the input voltage the lower the output current the converse is also true, the high the input voltage the higher the output current. Most batteries (all but a few specialty batteries) are charged at a constant voltage where the current determines the speed at which the battery charges. (Take the chargers for dragonwagon 1.0, these chargers produce a constant voltage with a current that diminishes as the battery charges). Please see my note on batteries at the end for a more detailed explanation of batteries. So that is essentially what we would be doing with the voltage regulator. The voltage regulator would be able to operate within a wide range of input voltages so the voltage generated by the motor equaling the battery voltage is not an issue. One issue that will come up is if the battery is "full" at this point the battery is unable handle any more current. At this point a short-circuit circuit will be implemented. This will discharge any further generated potential across a mostly resistive load. This will allow the regen breaking to still function without overloading the battery, yes energy is lost here but if you no longer have storage capacity for it what are you going to do. Please note that a voltage-controlled current source is a power device which means that it requires energy to operate in most cases voltage regulators are only about 75% efficient. This leads to charging a battery is not an efficient option. The alternative, using capacitors. The most common device used to store energy generated by regen-breaking is capacitors (generally of the super or ultra variety). Capacitor store charge because of this they work nicely for storing electrical power. In addition they are passive devices which means that their only losses are due to internal resistances which leads to a 95%+ efficiency. In the case of capacitors the voltage is kept low, around 2 volts which allows them to store large currents and power since Power = I^2*R (Power = V x I, V=I X R, ohms law, => Power = I^2*R). In this case a capacitor would need to be selected that is capable of storing much more energy then we could hope to produce via regen-breaking and in addition the same fail-safe for short-circuit circuit from the battery option will be implemented. Batteries store energy in the form of chemical potential. This potential equates to an electrical potential (voltage) across the terminals of the battery. The chemical potential is set by the designer/manufacturer of the battery and, neglecting decay, this potential will remain constant over the life of the battery. The capacity of the battery then becomes the current*time in the battery (this is why car batteries are rated in amp-hours). The reason that the batteries tend to drop in voltage as they are used is because the current from the battery runs down and no-longer has the ability to sustain the Power and by extension the voltage (P=I*V remains constant). The conversion between chemical and electrical potential an inherently inefficient, but well understood process. On the other hand capacitors store power in an electrical field which means their is no conversion between energy types (ie no chemical to electrical or visa-versa) which leads to a much more efficient process. The traditional problem with capacitors is two fold, first, until recently the die-electric materials used to make them severely limited the ability to store power and the second is that they are typically non-linear devices which makes them hard to model. Thanks. I appreciate the advice to “ditch” the regen, but this is central to our design. I know it is complicated as we must figure out a way to allow the motor to either 1) drive, 2) be driven, or 3) be disengaged. Yes, the rear wheel must be built symmetrically without dish. I'm Rich, the other grumpy old man, not John. I'm the one who sent the sketch of the jackshft drivetrain. I would also run the motor to the jackshaft & ditch the regenerative braking- in fact, that's what I did on my own bike with electric assist. I think I put a picture of that in John's & my powerpoint presentation. My jackshaft was a rear hub with freewheel. The motor drove the hub shell thru a 6:1 reduction timing belt, then the hub drove the left crank thru a chain & sprocket attached to its freewheel. When I pedal with the motor off, the freewheel turns but the hub doesn't, so I don't have to overcome the frictional torque of the motor. On my system I have no controller- just an on/off motor switch. I only switch the motor on while the bike is moving, so the motor drivetrain never feels the stall torque of the motor. Brad, I didn't quite understand your freewheel system for driving the motor in regen when I wrote my last post, but now I think I do. 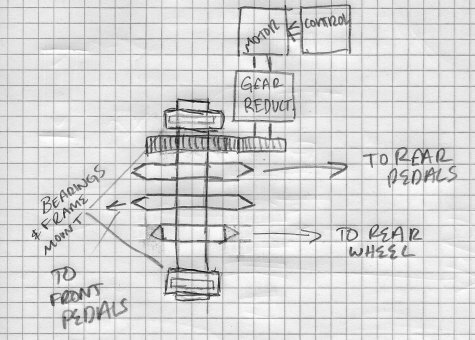 One unexpected mode of this is that if the motor is being driven by the wheel thru its one way clutch during regen, & the motor can drive the pedals thru another one-way clutch, then the pedals will be driven during regen. This might be disconcerting to the riders when descending or braking. If you must have regen, the cheapest clutch would be a roller that could be pressed against the rear wheel by a spring for regen, lifted off & latched up during other times. John Tetz made a system like this for a previous power assist using a weedwacker gasoline motor on a Lightning recumbent. goal is to have the motor make a large contribution during acceleration. to me that the motor will be doing 75% of the work during acceleration. which gear to "brake" in? lightest, most cost effective system. an exercise for the student. See if this floats your boat. could swap the axle for a 20mm steel one. Here's the link. output voltage was less than battery voltage & regeneration would cease. Doesn't this bring our "torque" sensing system into effect - the motor is almost always active - if we are pedaling the motor is working as well. Also, a freewheel will not allow us to use regenerative braking. How much loss does really translate to when compared with the aero-drag? I understand the need for gearing, how high rpms will we see with the "magmotors'? …..Absolutely not. The drag is way too high. I saw a statement something about a 1500 rpm motor having no appreciable drag. That 1500 rpm motor has to go thru a gear reduction. If you driving the chain rings they turn over around 70 to 100 rpm. So its not just the motor but the gearing you have to spin up to speed. ….Yikes !!!! These are huge numbers. Look at my Human Power Capability plot. The rider sustainable is do-able. 150 watts per rider means the time to fatigue is 3 hours for the Healthy Humans. The 600 to 800 is high. At 300 watts per rider that brings the time to fatigue down to maybe a few minutes. 400 is seconds. Even for trained riders - not first class athletes. .
Also remember these numbers come from very active people. Put them on a recumbent that they haven't had time to build the muscles those numbers need to be cut way down. Even if you are riding an up-right a lot the recumbent muscles are quite a bit different. Ok tying the above numbers into a motor needing to be in the 400 watt range. A 1500 rpm motor will be HUGE and heavy. So that’s out. You could find a smaller one but the rpm goes up. That means the gearing ratio has to be higher. Spinning thru the gearing and turning over a even medium size motor will do you in. Over the years I have found that a rider can easily feel an increase in power of 8 watts, so much so they will often drop down one gear to reduce speed and reduce that power load. Lets say they are pushing at 140 watts. Load them down to 148 watts and they will for sure want to drop speed to reduce that load. Have that power drag on all the time simply will wear out the rider. The cost of a freewheel is extremely low. I have made a power measurement on my chain drive system with the rear wheel of the ground. It takes about 30 watts to spin the motor/gear box (19:1) and the entire chain line. Unloaded the motor was running at its max at 7,400 rpm. So of course the 30 watts is abnormally high. I don’t know what the motor drag by itself is yet. I'll make that measurement in the summer when I take the trike out of the shell. Part of the reason is my motor has a lot more drag because it has permanent magnets in it. Its acting as a generator with various losses. A simple brush motor may have a bit less drag but not much less (brush drag etc). Don’t forget on a bigger motor the mass of the armature needs to be accelerated up to speed. Accelerating power is short time thing but its huge. And your accelerating over and over and over again during a ride. Yes the motor system is much less mass but its spinning quite fast. I bet Rich could do all the comparative calculations. I sent Brad my Power calculating spreadsheet which I didn't have time to go over with you. Put in some of the user values (underlined cells only - make a copy of the program first). Then see what kind of power is required to sustain a particular speed. Then type in an acceleration value such 0.3 mph per sec and see what the power has jumped to. A decently faired one will be 1.5 sqft. Attached is a sheet of clutch options. I believe we may have wavered from our initial plan for electrical disconnect. Initially we had talked about electrically separating the motor and figuring on free wheels for both passenger and driver. This is the best route as it keeps our weight (rotational and stationary), complexity and excess power consumption to a minimum. In addition adding a clutch will only add cost to our already limited budget. I am not avoiding the clutch, but I am trying to rationalize our spending. The current dragon wagon does not posses a clutch on the motor (or anywhere), and the motor shaft spins freely during non operation. While I do agree the motor *may* impose a slight resistance when disconnected, when I did my calculations which were presented at the end of fall term, the loses from that setup were marginal compared to wind drag on the vehicle. Motor design dictates this matter greatly. Perhaps John Tetz can provide some insight here. I also believe Joe feels the same way about motor freewheel loses, and I included his email below. The best option for simplicity sake is a electromagnetic clutch, but then you lose power to the electrical coil. As for a centrifugal setup, I am not sure if we will have rpms high enough to generate enough force for it to function properly. Mechanical is probably out of the question the system would have to fixtured to the vehicle, and controls added that would have to be operated by the rider, etc. Something of interest is that combined clutch brakes are available, which would make the system more feasible, but I have not inquired into the pricing on that. I will try on monday. If we must have a disconnect for the passenger, which was in the original email, then I would recommend including freewheels for both sets of pedals and a quick release on the passenger pedals. We are only wasting funds by including a clutch for them. Good questions. Joe, good answers. Mass, driver distraction, probability of malfunction. one direction, but not the other. 2) Give me a spreadsheet with costs of the clutches you are considering. The grant writing team and I will consider costs. clutch out of the motor side of things. will it do what we need?